Time was against me and I couldn't fix all issues I can see. It was a mistake to try this size. I am sorry for the messy looks. I haven't got half your skill, but the only thing I can see that legitimately needs work is the "fur" (or whatever) on his index finger. It has a strange look to it. Still, it's pretty damn good. I like how you did the phalanges, very realistic. It's too bad you ran out of time but it's still excellent. Like others have said, the detail of the wave is incredible. I'd sort of like to see what happens next! I like the idea of the calm water circle around poseidon, the hand with different fingers and the david vs golia atmosphere, really nice!! Yeah. From some point I was so sorry for putting him in such a bad situation. After all he didn't do anything bad to me. That's why I delayed drawing him and eventually run out of time. Okay. changed the preview to something more intriguing. I switched to the more relaxed version because AlabasterJazz asked me to continue on initial version of this piece and I decided it will be a good compromise to keep the initial version of his head. This way Anubis looks more..godly. Admittedly, only clicked on the preview because I saw it had 13 comments. Although others like the preview so don't let that bother you too much. Anyways, I was stunned when I saw the final piece! Watched the WIP, I agree on the staff/hand changes, but I think the position of the head near the end, with Anubis looking down on Posiedon was more interesting! What was the reason you changed it back to the more relaxed pose? Anyways, keep it up. I can tell you really strive for perfection and have an open mind about all the criticism you get on your images. I think this looks great. Pixeljointwise I would suggest taking a wave or hand part of the piece as preview. I almost missed it. This looks good. You should revisit it at a later date. @MrBeast, that gave me a great chuckle. I almost wish there was a Doge/Anubis piece in the challenge. imo it wouldn't take much extra detail in the background/face to tie everything up nicely. 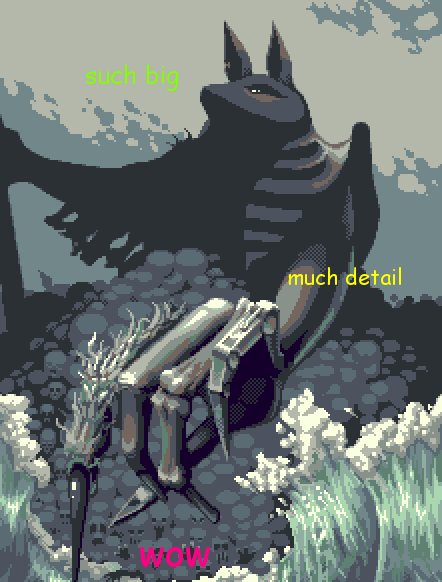 You don't want much more detail in the background features anyway, else you'll crowd the piece. Левая рука Анубиса выглядит коротковатой для такой огромной ладони. Даже с учётом перспективы. Ну и локоть не видно. Но, в целом, хорошая работа и интересная идея. Не очень понятно, правда, что там за зеркальный круг под Посейдоном. Despite what some people have said, I think this is a great achievement considering the time restraints and you've really taken a creative leap of faith, I think it's really paid off. It's a piece worth being proud of, we never stop needing to improve so don't let that stop you enjoying these results. size isn't the problem here... clash of styles is. anyways just the waves is worth a vote. Glad you finished this :) The waves are defininetely the best part of this. the cropped version looks better than the original. Maybe I should crop it, remove the waves and repost it outside of the challenge? poseidon could have been a bit bigger and impressive, this way it looks more like a joke. Yeah it kinda feels like you have some conflicting styles going on. The upper half has a bit more AA and vector-y style while the bottom half had more textures and details. Looks a little odd. But the individual parts to this are pretty nice (I like the preview and the waves quite a bit). A few parts seem a little lost/ confusing like the hairy finger and the bubbles/ foam from the waves, but it looks like a good effort. Wow! Seeing the WIP I never imagined you'd be able to polish it this much! Kudos!